Back-office technological compliance and control will make fintech LaaS platforms more attractive to large banks looking to partner. Point-of-sale products, at registers and online, represent one of the biggest opportunities for consumers and retailers in ensuring that seamless commerce adds to the bottom line. In addition, small-to-medium businesses, for whom the challenge of raising capital remains a hurdle, will also turn to alternative funding. LaaS is coming into its own. Why? LaaS platforms help both consumers and businesses cut through the red-tape of a traditional bank funding process, with lower overhead that gets passed to the borrower. According to CIO magazine, “LaaS providers can offer better rates and loan terms at a much swifter pace in comparison to traditional lending institutions.” The article goes on to describe the existing and upcoming technological enablement that has made LaaS a secure way to originate small-to-medium business loans and to help consumers during big-ticket purchases. An Entrepreneur article trumpets these LaaS providers as visionaries who, “leverage data from diverse sources, apply AI (Artificial Intelligence) and Machine Learning algorithms for credit scoring, and use innovative underwriting methodologies.” It’s true that LaaS providers must use technology wisely to gain or retain the ability to originate and manage loan assets securely, from origination all the way through the secondary market. For LaaS to gain the confidence of legal experts, rating agencies, warehouse lenders and investors, it will only make sense to provide the compliance required during transactions and beyond to access capital quickly. As I said in my earlier blog, companies like Affirm and Bread are a good example of how the LaaS model remains attractive to consumers. Similarly, home improvement loans from online lenders like Marcus and Marlette Funding will lead to more opportunities for the ABS markets (see more on this below). However, partnerships remain one of the biggest stories on the horizon for 2018. An announcement on February 23 added a new wrinkle to the LaaS opportunity for vehicle loans. U.S. Bank has created a new platform with AutoGravity where consumers choose their vehicle and their dealership and apply for pre-approval. Such opportunities have existed before at many larger dealerships and at U.S.-based automobile branded sites such as Ford. However, in January, Chase was the first national bank to partner with AutoFi, for this particular service. I predict we will see the largest national banks openly wooing LaaS platforms for similar deals. And those that have technological enablement that is compliant and that will stand up to litigation; easy for the consumer and small-business leader alike to understand; and passes on the savings of digital enablement—only these players will come out on top. The interesting thing will be to see how platforms like LendKey and others will end up being acquired—if they have the right technology and can prove it. More and more banks will end up evaluating the acquisition of a LaaS platform as the fastest path to keep up with the digital transformation of the space. Many of these LaaS offerings will try to attract multiple audiences — both the small businessperson and the consumer, for example. As we move further into 2018, these hybridized programs will be increasingly attractive for LaaS platforms to pursue and to the banks that want to partner with them. You might be wondering: How can I get in on this action? A good first step is to download our white paper Building Future Certainty in Asset Management for Marketplace Lenders. The paper outlines what your company needs to get ready before you go completely digital—especially if you’re a LaaS platform provider or a community bank that wants to go it alone (create your own, much-simpler-than-you-think LaaS platform). Banks and investors can also use this white paper to check out prospective LaaS partners–do they have the technological enablement empowered by eOriginal to compete in the marketplace? 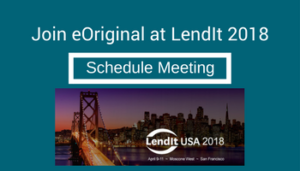 Attending LendIt USA 2018? Schedule a meeting today to understand the impacts of digital transformation of lending LaaS. Please feel free to contact me directly with questions or observations: jjacobs@eoriginal.com.